Coppa is one of those restaurants that I kept meaning to get to. Chef/Owner Ken Oringer is legendary on the Boston food scene, with restaurants as diverse and well-loved as Clio, La Verdad, Toro, and KO Prime to his name. The other Chef/Owner, Jaime Bissonette, has not only worked with Oringer at several of those restaurants, but he’s the sort of young, funky, tattooed chef who gets profiled all over the place. All signs pointed to Coppa being a great dining experience. So what took me so long to get there? I’ll admit it, location was a huge factor. 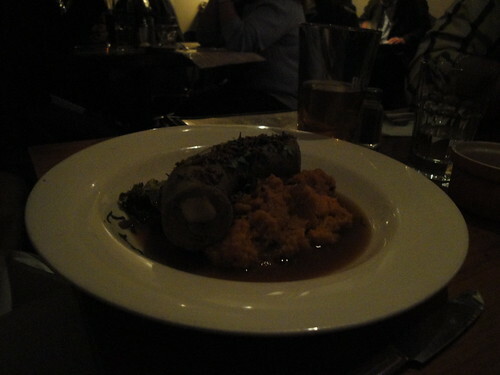 Coppa is tucked away on a little side street in the South End that just isn’t that convenient to my nightlife. I’m in the neighborhood once a week during the school year to volunteer, but the middle of a work day isn’t the best time to visit a restaurant that calls itself an enoteca – while it’s not literally a wine shop, there is a very serious Italian wine list. I was also concerned that this would be a splurge meal – something I have no trouble doing, but I needed an excuse for said splurge. One finally came in the form of my third marathon, which I ran with two friends with similar attitudes toward good food and drink. We would celebrate our accomplishment with wine and meat! Because that’s Coppa’s specialty – a marvelous selection of Italian salumi, cheeses, and meaty delights. This is not a restaurant that vegetarians would enjoy. Thankfully, I am no vegetarian. So, did it live up to my great expectations? 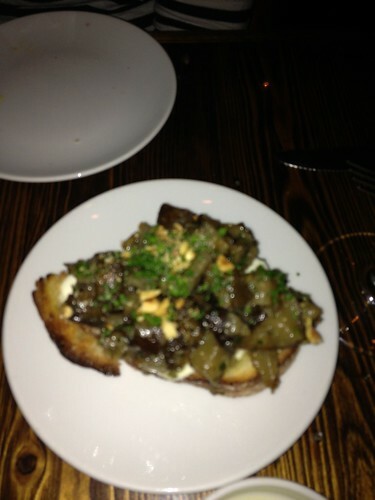 We started with pretty much our only vegetable dish of the evening, little crostini topped with sunchokes and marscarpone cheese. 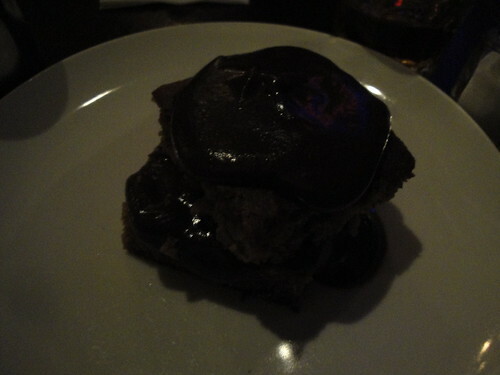 (apologies for the blurry picture – it was quite dark in the restaurant. 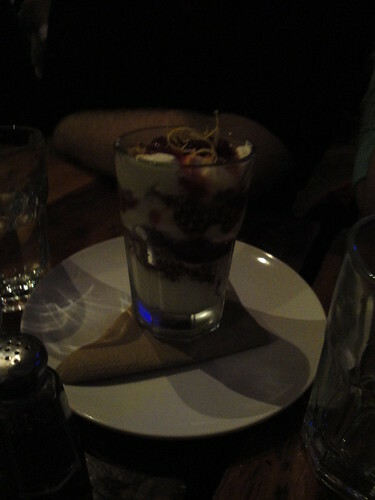 Eventually I caved and used my flash.) This little bar snack is seriously fantastic. If you’ve never had a sunchoke, imagine a cross between a chestnut and a mushroom – nutty but earthy at the same time. Our other non-meat dish was the burrata, which is type of insanely buttery mozzarella cheese made right in Somerville, MA. If it had been acceptable to lick the plate, we would have. These are pig’s tails, roasted in a wood-oven and glazed with mostarda. They are tiny nuggets of pure joy. If I could eat them every day, I would be extremely happy for the rest of my incredibly shortened life span. 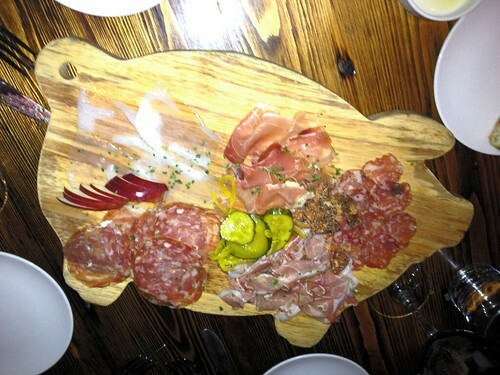 Naturally, we couldn’t visit Coppa without getting a salume plate. Regrettably, I forgot the name of nearly everything on this platter the minute she put it down, but I DO know there’s some lardo on that piggy, because we asked for it, and it was amazing. Also, how adorable is that tray? 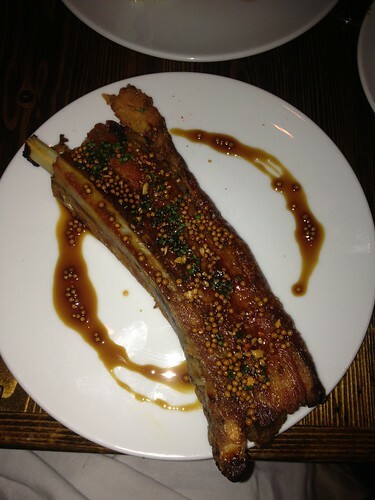 This was an entree special of an extremely decadent rib. Though just one, the meat was plentiful. 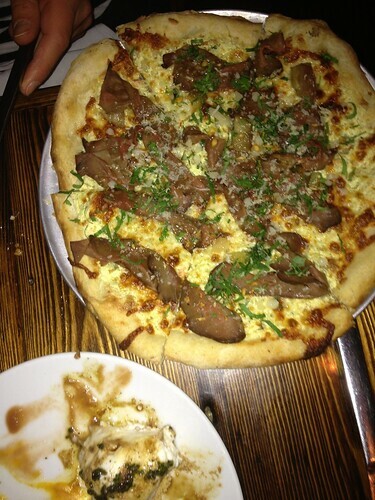 Finally, we did try one of the wood-fired pizzas – bone marrow with beef heart pastrami and horseradish. If, like myself and the ladies I was dining with, the combination of beef heart and bone marrow on your pizza tantalizes, GET THIS. It is outstanding, meaty and silky and cheesy and wonderful. If, on the other hand, like the young couple on a date next to us you are in fact a pair of very confused vegetarians, DO NOT EVEN ASK what is on this pizza. You will be sorry you did. The atmosphere in Coppa is jovial and close – the space is teeny tiny. Everyone seems friendly and the wait staff is lovely, but if you’re in Boston and want to go, I’d get (I did in fact get) reservations, because there’s really not the space to wait. 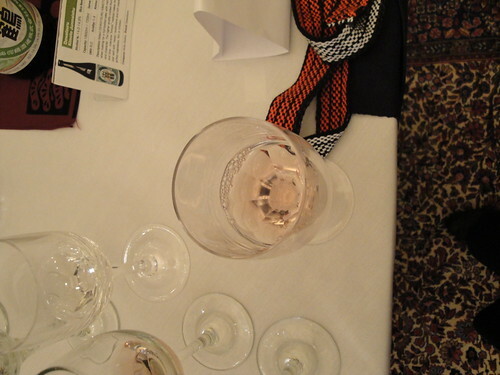 Since they call themselves an enoteca, a note on the wine: I thought it was fabulous. I also really love Italian reds, so this seems like a no-brainer, but I felt like Coppa carries interesting grapes for a reasonable by the glass price. They don’t have a full liquor license, so the cocktails are all cordial-based (Boston has some weird liquor laws). That’s not really my scene so I didn’t try them – but if you have I’d like to hear about it! In previous posts I’ve outlined my love of food science, and of Harold McGee particularly. And of course, my affection for cocktails is well–documented. So it will come as no surprise to hear that when I had the opportunity to hear the man himself talk about the science of cocktails, I was all over it. I gave the heads up to my friend Jess, another avid cocktail fan, and we set out to get schooled. Joining Mr.McGee was Dave Arnold, the Director of Culinary Technology at The French Culinary Institute. 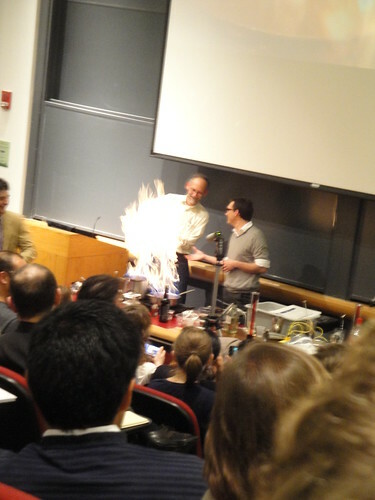 Basically, the way the lecture worked was that Dave would do something crazy onstage, usually involving fire, then hand out the resultant samples while Harold would talk about the science of taste and the physical properties of alcohol. In other words, it was awesome. 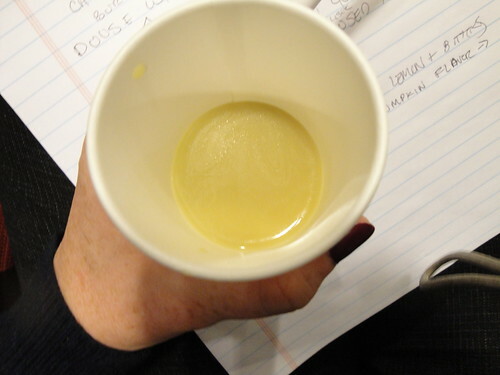 This was bourbon mixed with the very essence of banana – banana juice, if you will. It was uncanny. 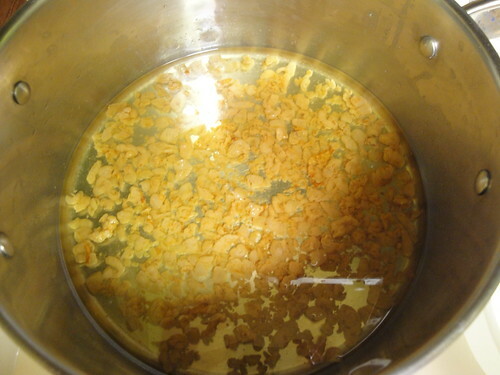 Scotch with all of its impurities removed (but not its flavor). It was weird – the skeleton of Scotch. 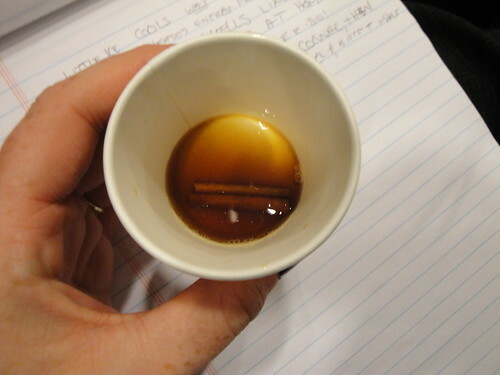 The best part of the night came when Dave made his recipe for Red Hot Ale, a drink that dates back to Colonial times. First, he demonstrated the method with a hot poker – the drink was traditionally made by sticking irons from the hearth into a mug. Clearly, that’s no longer a practical option, so Dave invented his own hot poker. Alas, it’s not really ready for the average bar just yet. 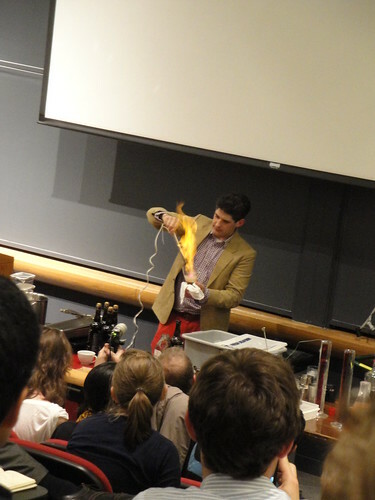 So then he showed us his stove-top method, which was…dramatic. That’s Harold and a lab assistant, singeing off their eyebrows. 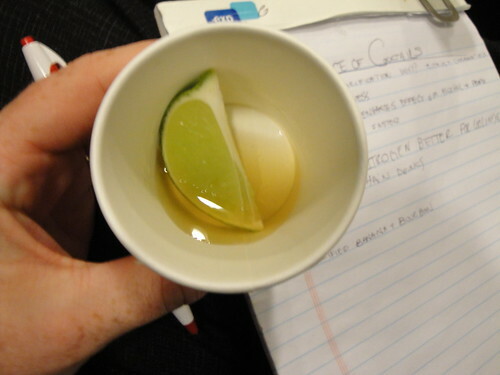 This was easily the most delicious drink of the night, despite (because of?) the fireworks. Here’s a recipe if you’re interested – I’ll admit I have a slight fear of burning alcohol. Maybe one day I’ll get brave enough, though, because the caramelized beer and cognac is truly remarkable. A combo of gum arabic and xanthan gum achieves this magic. I wasn’t incredibly into this particular drink, but the idea of making truly stable emulsions is intriguing – perhaps a different oil would have been more enjoyable. 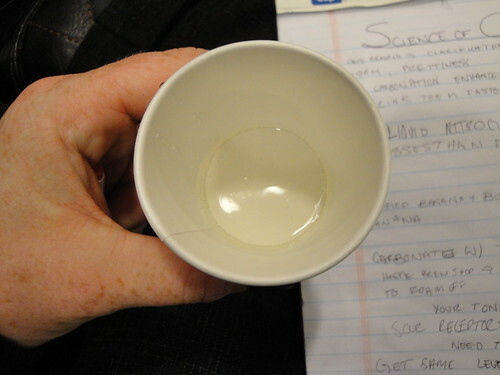 My favorite actual science moment of the night came when Harold explained why adding water to spirits like whiskey enhances its flavor – something that has always fascinated me. Essentially, it all comes down to the fact that ethanol, the alcohol we drink, attracts aroma molecules. Aroma molecules (remember, most of taste is really smell) hang out little molecular cages on the ethanol because they’re similar in structure to it.This stops them from reaching your nose. On the other hand, they HATE water. When you add water to a drink you drop the concentration of the alcohol and these aroma compounds, break free from their cages for us to enjoy. Here’s a more coherent explanation from Harold himself. Harvard does a whole series of these lectures using McGee’s On Food and Cooking as the text, and the guest lectures, all by amazing chefs and food scientists, are open to the public. If you’re local to Cambridge check them out! 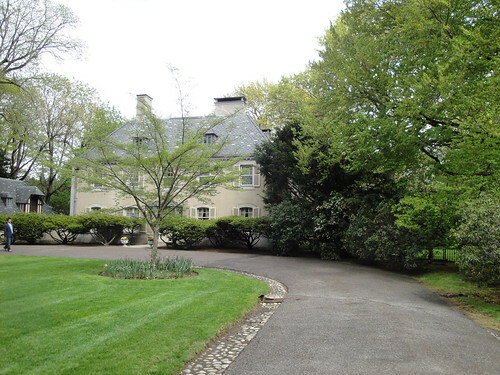 That’s the home of the Boston Consul-General of Japan, Takeshi Hikihara! 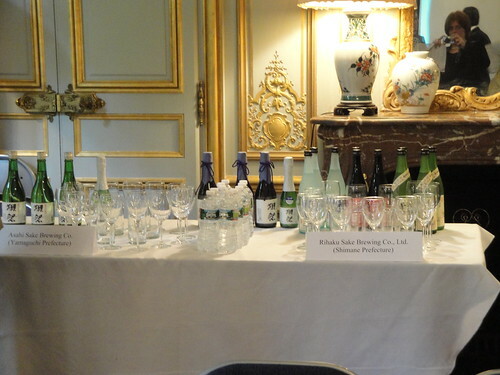 The purpose of the seminar was to learn more about and taste a variety of high-end sake – to show that even with all of the recent tragedies Japan has gone through, they are still creating fantastic, safe, high-quality products. In addition to the immediate problems caused by the earthquake and subsequent tsunami, Japan is forced to struggle with consumers who may be fearful that their exports have been exposed to harmful radiation from the affected nuclear reactors. This was a chance to show that this is not only not true, but that the sake creators are still making superior beverages. 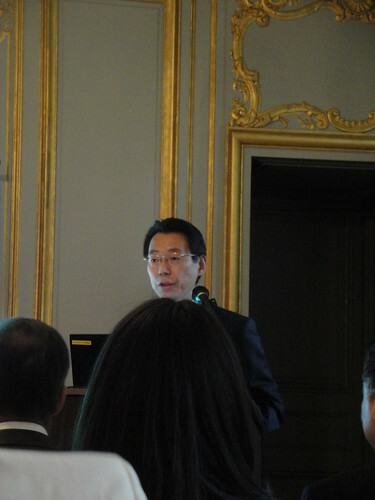 Meanwhile, Haruo Matsuzaki, chief of the sake export group who were involved in putting this event together, asked us to remember the passion of the sake-makers for their product. 1. 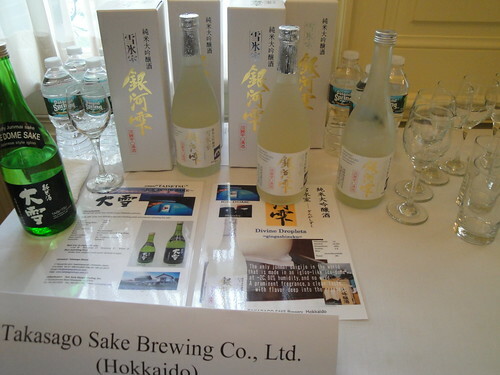 Sake is brewed, a bit like beer, rather than fermented like wine is. Sake is made from rice, and rice is pure starch. Fermentation requires sugar to work, so some of that starch must be broken down. 2. 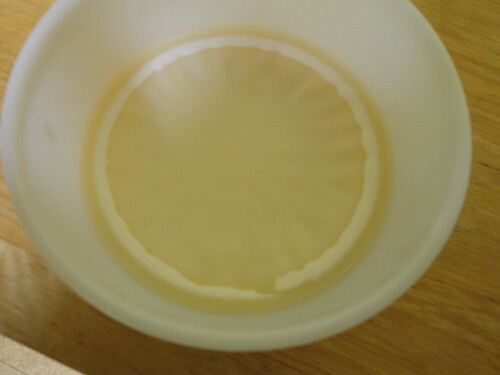 However, unlike beer, where the starch is broken down into sugar, and then, in a whole different step, fermented, sake has this break down and fermentation happening at the same time. 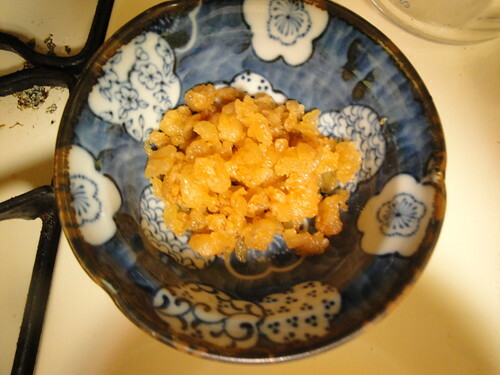 This is accomplished by infecting some of the rice with a special kind of mold, called koji. 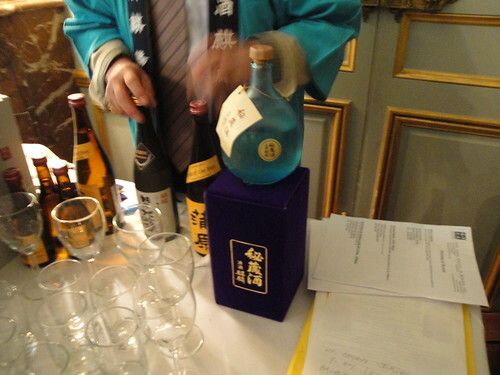 Because both of these things happen simultaneously, sake’s alcohol content is naturally higher than that of beer and wine, usually around 16%. 3. Most sake is not aged. About 90% is meant to be consumed a few months after brewing. There are a few notable exceptions, however. That said, even these are not cellared as long as certain wines or spirits. 4. 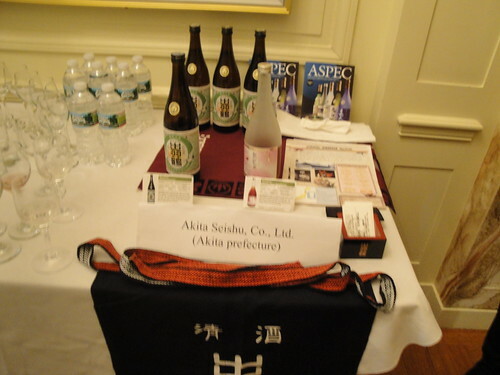 To a degree, sake quality correlates with sake price. This is because the three tricks to better sake are better rice, rice that is highly polished (meaning you are losing quite a bit of the grain) and is more time-consuming to make. All of these factors lead to more expensive sake. 5. The catch-all phrase for the top four grades of sake is “ginjo.” While only 7% of sake available fits into this category, this is the premium grade product. 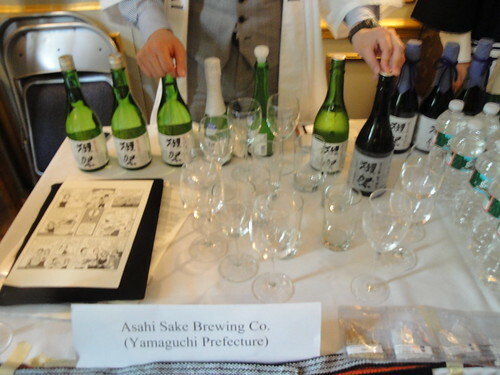 It further breaks down into six different styles that are primarily differentiated by how much the rice is polished, whether amendments such as additional water or alcohol are allowed, and how it is brewed, but the term “ginjo” will at least get you to the quality sake. Gaunter’s main point was that to enjoy sake, one doesn’t need to know everything about sake and its rich history – one must simply drink it and enjoy it. 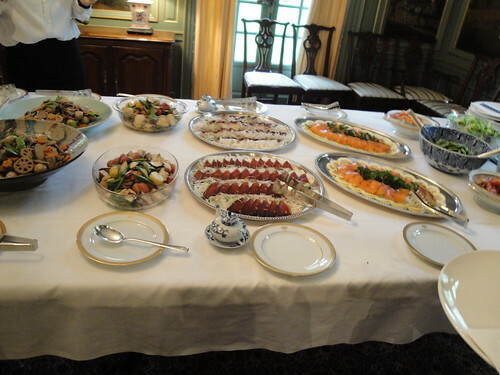 He also pointed out that it went well with food of all kinds, and the Consulate did not disappoint in this regard. 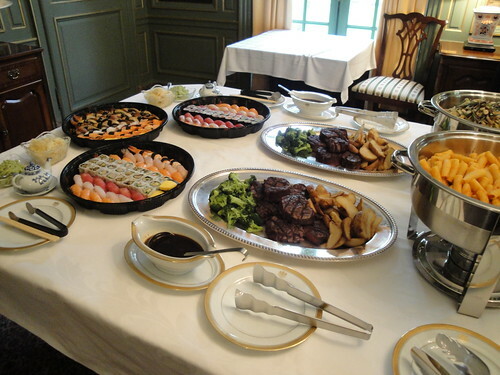 This was the “light buffet” prepared for our tasting pleasure. 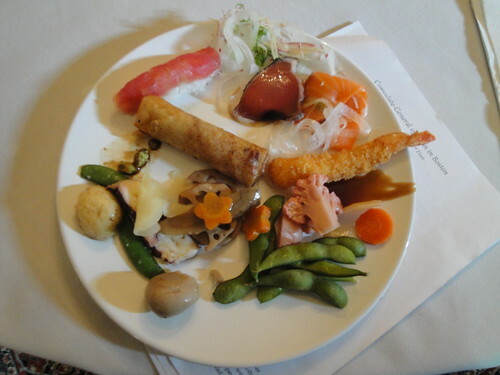 As you can see, it involved dishes of both Asian and Western pedigree. 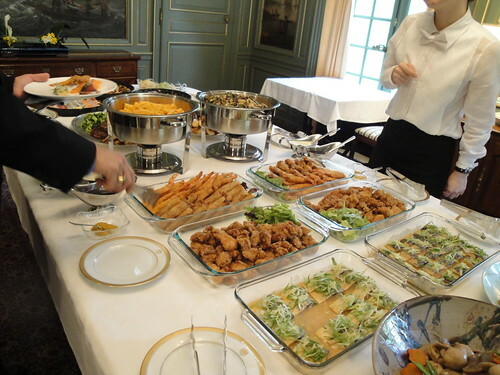 Truly, it was the most complicated “light buffet” I’ve ever seen. Usually those words describe some salad and over-rare roast beef. My sake-tasting partner and I elected to eat lunch before embarking on the rest of our sake journey, since we had up to 20 to get through, and, as mentioned, the alcohol content of sake is quite high. 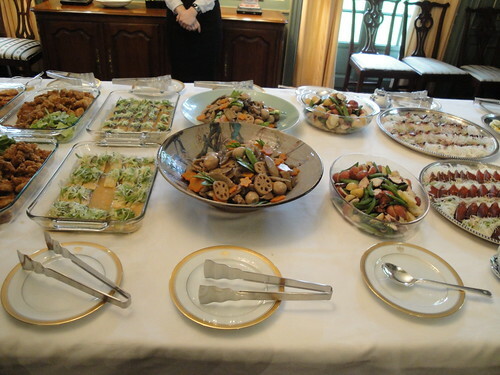 We also vowed to do a considerable amount of tasting and spitting, a practice that is just good sense if you want to maintain your dignity in the Japanese Consul-General’s home. Everything was outstanding. A gentleman from Harvard’s Japanese Studies department informed me that the house chef made his own pickles, which were delightful, and the spring rolls were a revelation. Armed with this base I commenced to tasting. 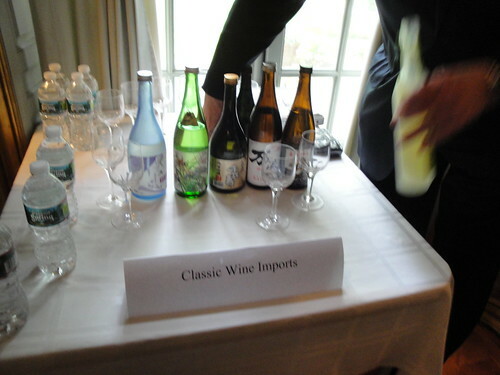 To a palate informed by beer, wine, and cocktails, sake is a nearly alien beverage experience. The flavor is light and very floral, yet hot from the high alcohol content. It was a fantastic day, and a wonderful opportunity to learn more about a spirit I hadn’t really understood. I learned a lot, had amazing food, and all in a gorgeous setting. Here’s to saying yes! Way, way back in 2006, I read an article in the New York Times about pie crust. The perfect pie crust, to be more precise. Long time readers of this blog know that I have a vested interest in this topic – I am determined to master that simple yet surprisingly difficult pastry. If I’m being completely honest with myself, I want people to notice my pie crusts, to be struck by their perfect balance of tenderness and flakiness. This is not a humble goal, I realize, but hey, the goal’s not for ME to be perfect – just the crust. So anyway, back in ’06, there was an article on making the perfect pie crust, and while I read it, intrigued, I didn’t actually do anything with that article, or achieve that crust, until half a decade later. Why is that, you may be wondering? What stopped this lady, who seems to balk at no challenge, no matter how ridiculously complex or silly, from making her dream crust? I’ll tell you in two words. Specifically, leaf lard. Y’see, pig fat comes in three grades. The lowest grade is caul fat, which is far too soft for pastry baking. It’s found around the digestive organs of the pig and is typically used for sausage casings and for adding much-needed fat to lean cuts of meat. Next up is fatback, the fat to which we’re most accustomed. 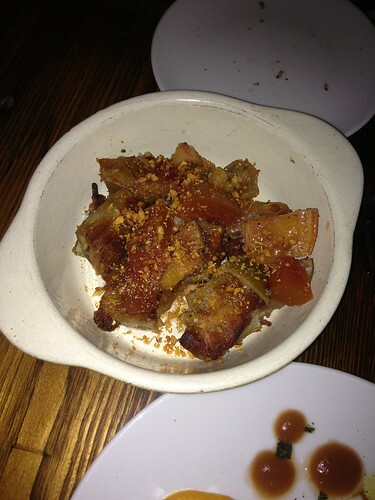 It’s found between the skin and the muscle, and it’s the fat of your slab bacon and chicharrón fame. Fat back is actually plenty hard, and renders out well. The problem become obvious though, if you’ve ever eaten bacon, or chicharróns, or lardons. Fatback tastes like meat. It makes an awesome fat if you want to make some french fries (though suet, which is beef fat, was traditional before vegetable oil became the norm) but in a dessert it’s somewhat disconcerting. So, leaf lard! Like caul fat, it’s a visceral fat, meaning it’s found around organs, in this case the kidneys and the loin. 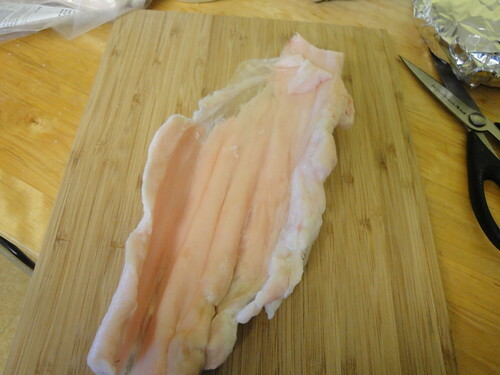 Unlike caul fat, it’s hard, has a fairly high smoke point, and unlike fatback, it has very little porky taste. In short, it’s a dream fat for baking. While I typically use an all-butter crust, for the flavor, (because I think shortening is kind of nasty) there are problems with butter as your primary fat – largely, that it is not just fat. It’s milk solids – that’s the deliciousness – but there’s also water in there. If you’ve read the post linked above, you know that means gluten, and too much gluten is the enemy of tenderness. A half-butter, half-pure fat crust is the way to go, but again, shortening is yucky. 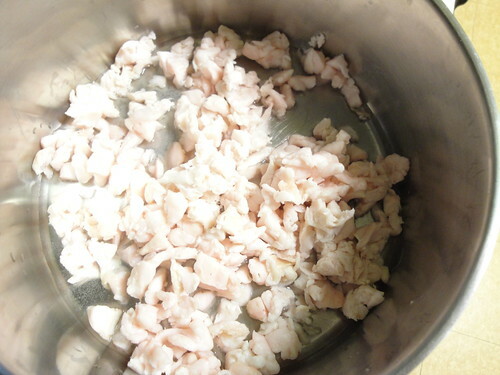 However, we can hearken back to the days of our ancestors with some leaf lard – good old fashioned animal fat! But the article, by Melissa Clark, made using the lard seem a bit arduous. I didn’t want my house to smell like a pig, nor did I want to pay $20-$30 for pre-rendered fat. And so, I put it out of my mind for a time, and settled for a less-than-perfect (but still pretty delicious) all-butter crust. So what changed, you might wonder? Well, for one thing, this blog. Rendering my own pig fat and baking a pie with it seemed like an appropriate task for these pages. Then too, since 2006 we’ve gotten more Farmer’s Markets and organic meat possibilities in the area – I have more access to weird offal these days. And so, on a recent trip to the brand-new Somerville Winter Farmer’s Market, I decided to ask the fine ladies of Stillman’s at the Turkey Farm if they had any leaf lard. They did, pretty much just enough for my purposes. I purchased it and began my adventure! It can’t be used like this, it needs to be rendered. 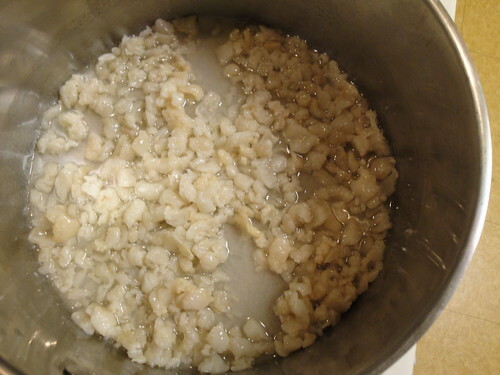 Remdering makes the lard stable and removes all of the extra, non-fat bits that we don’t need in our pie. I followed the instructions on Chichi Wang’s awesome Serious Eats column, The Nasty Bits. (Seriously, if you need recipes for weird spare parts of animals, she’s got it.) It seemed easy enough! At this point there was definitely a slight “barnyard” odor to the fat. I feared that the entire household would annoyed with me, but it was far too cold to open a window. 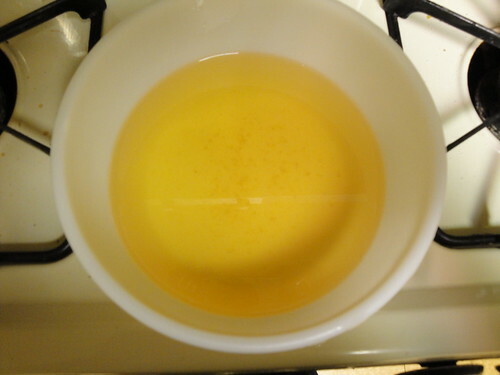 Add some water and start cooking at a low temperature! Seriously, you just really have to leave it alone and stir on occasion. The water keeps the fat from burning and also improves the end product. These get strained out of the fat. You can basically eat them as a little, very decadent snack later! Or not, if that wigs you out. Pretty easy, and not nearly as smelly or painful as Ms. Clark led me to believe! There is something very satisfying about a project like this, using up the bits of an animal that might otherwise go to waste. 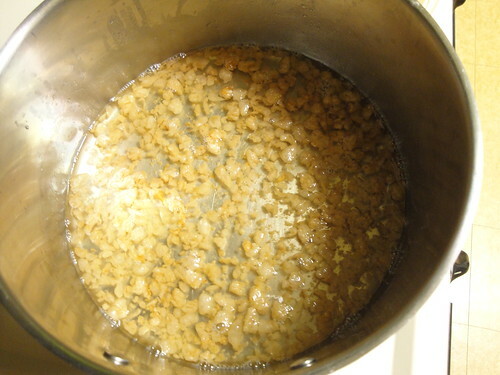 In my next post, I’ll show you the resulting pie! There will also be a poll about our next food adventure, so watch out for that. Orange Line Adventures, Part II! As promised, the continued saga of our trip to JP and the Scottish delights we encountered there! After thoroughly enjoying all of the appetizers, it was time to dig into our entrees. 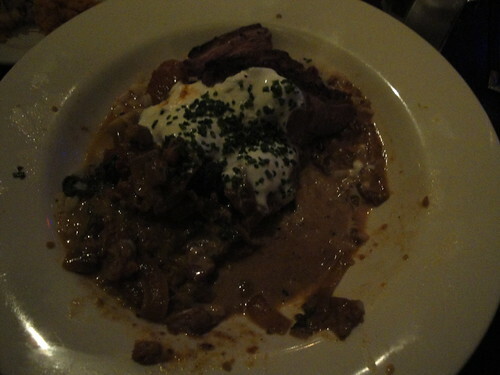 For the most part we tried for “traditional” fare, though we made an exception for duck. It is imperative, if you’re dining with me, that you always make exceptions for the duck. For my own part, however, I went with the sassitch and mash. The sassitch refers to a lovely house-made sausage, in this case pork combined with apples and sage (you can see a bit of apple poking out in the photo! ), always a fantastic group of flavors. Mash can mean any of a number of mashed vegetables, often turnip or potato, but in this case roasted sweet potato, to play nicely with the fall flavors of the sausage. Finally the kale on the side added a bit of much-needed bitterness to balance all of the sweetness, and the cider-jus, with bacon and duck stock, was to die for. The leftovers made a killer hash the next day, too! 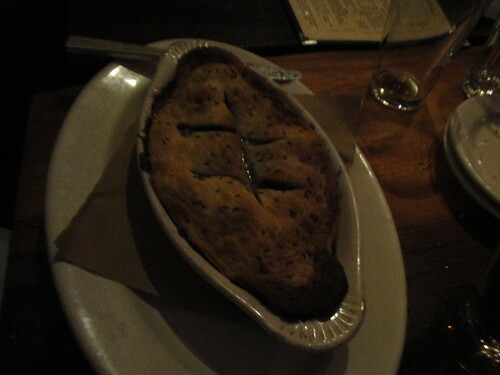 The beef and ale pie! The ale really brings out all of the flavor of the beef, and the caraway crust was perfectly flaky. Hard to see, alas (it was VERY dark!) 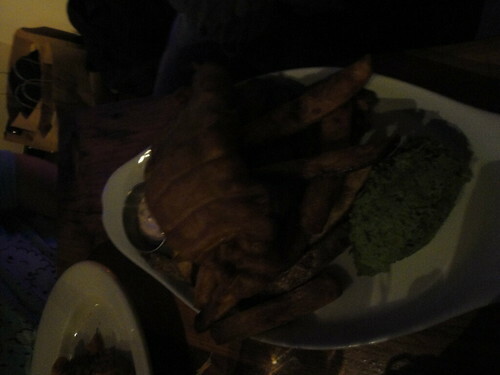 but this is the fish supper – beer-battered haddock, thick chips, and mushy peas. Fish and chips, but very, very good ones, some of the most tender fish I’ve had outside of home in my life, and the batter was thick and delicious. I’d never had mushy peas before – essentially mashed fresh peas with mint. Very green-tasting, and I liked them, but they were served cold and I think I prefer my veggies of this type hot, as a general rule. 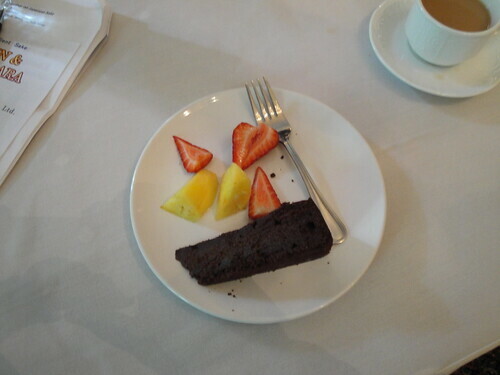 Others at the table had no such qualms, however, and they did not go to waste! Our duck exception, and it was exceptional! The duck was perfection, crispy outside, still rosy inside, and served with mustard greens, red curry, and some kaffir lime yogurt that makes me want to go back and ask for the recipe. Now I know that at this point you might be thinking, “BUT WHAT ABOUT THE HAGGIS?” Fear not, my lovelies, for it was ordered and it was eaten. I didn’t get it as my personal entree because two other folks at the table were getting it and I wanted to make sure we had our culinary bases covered (though I needn’t have worried, two other folks ordered the sassitch!). 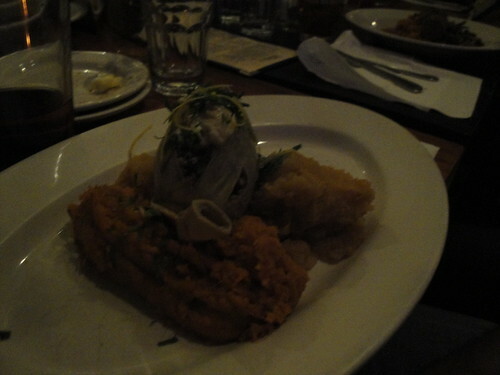 A few words about the Haven’s haggis, before I give my thoughts. First, rather than a sheep’s stomach, they use a beef sausage casing. Secondly, they forgo the pesky, only-recently-legal lungs in the filling,though the heart and kidneys are still present. Finally, they serve it with a Drambuie butter, which maybe the tastiest damned thing that’s happened to butter in many a year. I think I may need to make some of my own to keep around the house and spread on everything. And so, my thoughts – fantastic. The filling ends up being soft and rich, with the strong flavor of the heart coming through. Served on a bed of mashed sweet potatoes and rutabaga, this was a perfect winter food. 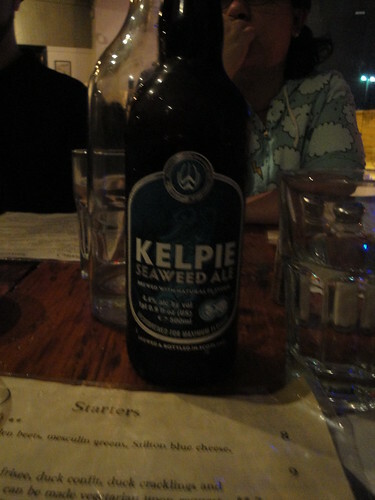 All of this was washed down with a Kelpie Seaweed Ale, a Scottish chocolate ale brewed with bladderwrack seaweed. Think chocolate with a bit of brininess. Tasty, and low-alcohol enough to go well with dinner – plus I really loved the label! The great thing about dinner with 9 people is that you almost always have room for dessert, because you’re sharing nearly everything and eating tiny, tapas-like amounts of it all. Even better, if you’re lucky, with 9 people it is totally reasonable to order EVERY DESSERT ON THE MENU and eat the round-robin style. If you have never had such an experience I highly recommend grabbing 8 other people and finding a spot that carries 4-5 dessert options. You will not regret this. 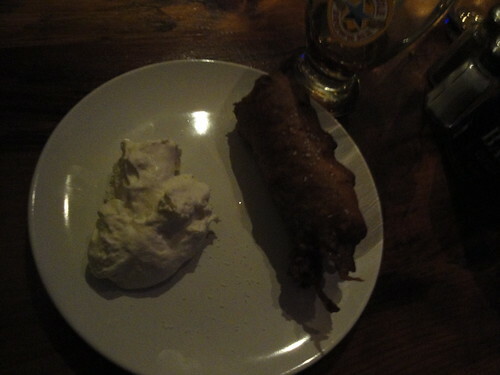 A deep-fried Mars Bar! Way better than any of us had expected it to be, mostly because it was lightly sprinkled with sea salt, which the ladies at the table figured would make nearly any dessert appealing to us, but also because it was all melty and warm inside, and the coating was crisper and tastier than I, for one, was expecting. 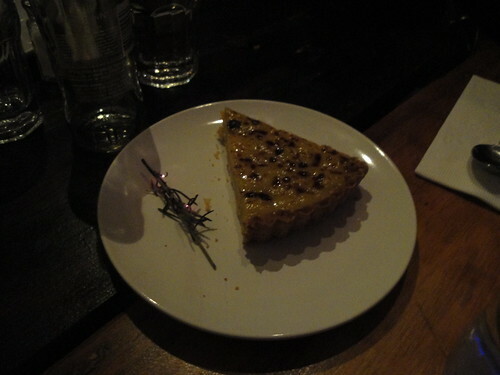 A tart of lemon curd, scented with rosemary smoke. 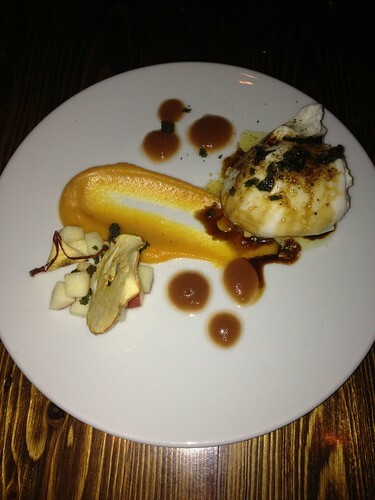 This was the most flamboyant dish, coming as it did with elements that were on fire. You can pretty much always impress with open flame tableside. The taste was also fantastic, however, like a lemon square that had upgraded from the church bake sale and learned to be fancy. Here at Adventures in Food we like to keep it classy. 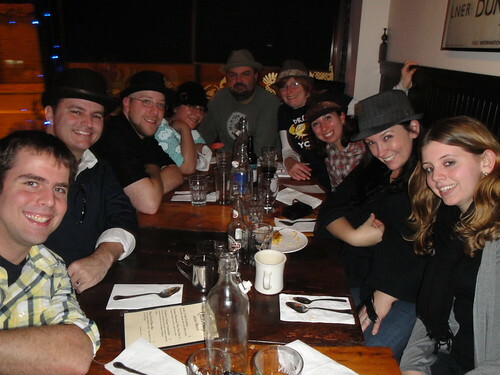 It is painfully obvious who did and did not skip the hat portion of our day, but we love you guys anyway! A big thank you to the delightful staff of The Haven, who put up with a rotating number of people, our ridiculously early selves, and a very large party with grace and charm. I can’t wait to go back and try their brunch! How often do you get try new fruit? Don’t get me wrong, there are a lot of fruits out there that I haven’t tried. The fabled durian and I are yet to have an encounter, and there’s always the ackee or breadfruit or a black sapote. Yet the very reason that I haven’t tried them is the one that makes new fruit exciting – they’re very hard to come by. Many fruits stop ripening once they’re plucked, and rot soon after they’re ripe, making them hard to transport over long distances. Throw in the danger of bringing exotic diseases and pests into the country, and it becomes difficult to get your hand on fruit that can’t be grown in your (relatively) immediate vicinity. (This is also why the fruits we do manage to haul over long distances – citrus, for example – are not nearly as good when you buy them where they don’t grow.) So, while I do believe in reducing your carbon footprint and eating locally where possible, I have to admit, I get pretty excited at the opportunity to experience new fruits. Enter Kam Man Food! Directly after the Filipino food adventure in Quincy, my band of intrepid friends and I headed over to this impressive Korean grocery store and market. Both Elise and Valerie have shared some adventures in the home goods department – check them out. True to the spirit of this blog, however, my heart belonged to the grocery store, and in particular, to the large bag of hard purple fruit that we found there. Mangosteens! Mangosteens come from Southeast Asia and require ultra-tropical conditions in which to grow. This makes them a lousy crop for most of the United States. Throw in concerns around the Asian fruit fly and let’s just say that they’re not the easiest fruit to come by in these parts. I’ve had them freeze-dried from Trader Joe’s and enjoyed them, but here was my chance to try the real thing! So I bought them for a pretty penny and brought them home. 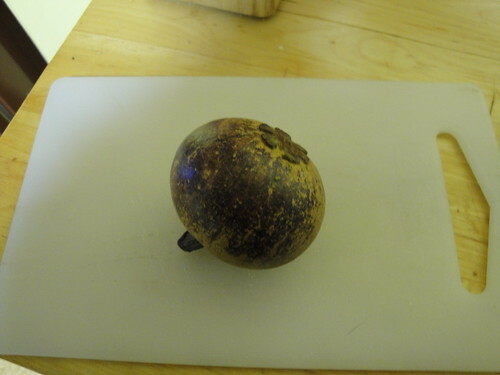 The dark purple outer skin isn’t edible – like the pomegranate, the edible part of the mangosteen is an aril – a fleshy coating to the seeds inside the fruit. 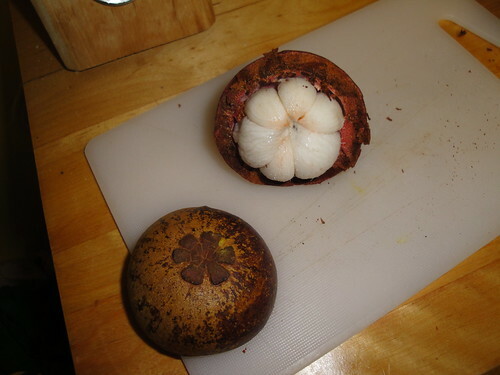 Unlike a pomegranate the mangosteen arils are quite large and less numerous – they actually correspond to the petals on the little flower shape on the bottom of the fruit! There are always 4-8 of them. Should you ever have one of these in your possession, I’ll let you know they aren’t the easiest fruit I’ve ever tried to open up. That outer skin can be up to an inch thick and is rather tough, but I got through eventually and managed not to slice right through my prize! The fruit inside is white and soft, and looks like a bit like a goth orange. I plucked the segments out with a fork and dug in. The texture was very soft and pulpy, but not unpleasantly so. And the taste! A mangosteen tastes like a peach and a banana had a baby, with a faint hint of citrus acidity on the finish. The fruit doesn’t have much of a fragrance, so the amount of flavor is a wonderful surprise. I found myself wishing they were much bigger! 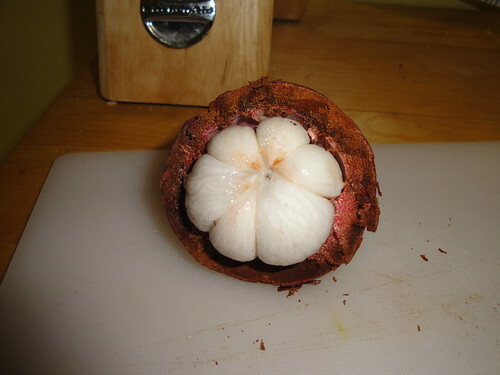 It’s said that the mangosteen is the Queen of Fruits, and it’s easy to see why. This treat is a bit too expensive to be enjoyed regularly (and sadly, all of the nutrition is in the inedible exocarp – some companies grind it into the juice to create an antioxidant-rich drink) but it was a wonderful coda to my Quincy adventure. Next up, for better or worse, I hope to experience the fruit king! Today I have a few exciting announcements! They’re largely applicable to those of you who live in the Boston area, but even if you’re not local it’s all worth knowing. Let’s start with the one that’s actually happening today – the long-awaited opening of The Boston Shaker’s standalone store in Davis Square! You may remember from my bar tools post that the Boston Shaker is my go-to spot for the latest and greatest in bar tools, books, and bitters. Until today, I had to schlep out to Union Square on my bike or the bus – but no longer! Adam’s beautiful shop is within walking distance of my house, and right on my commute home. If you are not so blessed, visit the online shop at thebostonshaker.com. You’ll be glad that you did! Next up, even though it is not Sunday Run Day, I have a marathon announcement – the next big fundraiser! This is a joint effort between those teammates who work in the Boston Partners in Education office (of whom I am one, which you should be aware of if you read this blog ever.) We are hosting a trivia night at the Crossroads Pub in the Back Bay on February 19th, at 6 pm. Tickets are $10 each, but if you put together a team of 4-6 and pre-pay, you’ll get $5 off! We’re going to have some fantastic prizes, so come out, have some fun, and support us at the same time. Contact me to pre-buy tickets or for more information. Space is limited to 100 people, so don’t delay! Finally, I would like to announce to all of the amateur cooks out there that the Boston Lamb Takedown is coming up on February 28th! The Takedowns, the brainchild of Matt Timms, are basically big ol’ cook-offs – but a bit hipper than your average Pillsbury Bake-Off. I’d really love to enter, as I’ve got some interesting ideas (they involve dried fruit, ala Katniss’ favorite meal in The Hunger Games) but I think it’s a little too much to put on my proverbial plate at this point in my training. Next time, Mr. Timms, NEXT TIME! If you all have time, you should show off your skills. In any event, tickets to simply eat the fantastic creations are only $15, so even if you’re not confident in your lamb-cooking prowess you can still join in the fun! It’s at the Middle East Club in Cambridge, and you’ll be able to purchase your tickets through them. Oh, and if you DO enter, let me know! I hope to see you at any and all of these exciting events – it’s going to be an amazing February, and how often do you get to say that?